How to evaluate and choose public schools in New York ? Moving to a particular neighborhood in order to land a seat at a coveted public school has long been the middle-class modus operandi for obtaining a high-quality education in New York, where placement in many elementary schools is determined by home address. But navigating school zones has become much trickier in the past few years as more families with young children put down roots in the city. Even living two blocks from a well-regarded public school no longer means your child will get in, and with many neighborhoods becoming increasingly expensive, it isn’t always possible to squeeze into a smaller apartment. In November the attendance boundaries for Public Schools 321 and 107 in Park Slope, Brooklyn, were redrawn to relieve overcrowding, which was bad luck for families who had bought their homes specifically because of those schools and suddenly found themselves zoned for another. Even without rezoning, families living in districts with overcrowded schools may find their best-laid plans upended. Last month, more than 2,300 children, or roughly 3 percent of applicants, were put on waiting lists for kindergarten seats at 105 schools, according to the Department of Education. Although the overall number of children on waiting lists is down slightly from last year, waiting lists at some schools soared. The waiting list at P. S. 41 in Greenwich Village had 100 students, up from 55 last year, and the one at P. S. 307 in Queens had 167, up from 109. Many children on waiting lists end up securing spots as families of enrolled children pursue other options: moving away; placing their children in private schools or gifted-and-talented programs; or winning lotteries for charter-school admission. But the wait to find out can be excruciating. By the end of June, those who remain on a waiting list will receive an offer of an alternative school. All of this is forcing families to consider new ways to navigate the city school system. Some do school research even before a child is born. Other parents pay specialists to help identify neighborhoods with up-and-coming schools, the hope being that if they move to these places now, the school will have improved by the time their child reaches kindergarten. There have always been people who outright lie by borrowing an address from a friend or relative to get their children into a school. If caught, however, those students will lose their seats. Sure, it’s easy to mock the neuroses of New York City parents when it comes to their offspring, as films and documentaries have done. But the city poses unique challenges, and as a result, more families are thinking earlier about where they want to live in relation to what it means for their children’s education. “Anyone who thinks it through realizes you can’t count on one option,” said Christine Dirringer, a commodities banker who, with her partner, Keith Richards, also a commodities banker, is selling an Upper West Side two-bedroom and looking for a town house in Carroll Gardens or Park Slope. The reasoning: Both areas have good public and private school options and offer more space for the money. Chloe, their daughter, hasn’t celebrated her first birthday yet. Here are some of the ways families with young children are approaching the complicated calculus of real estate and education in the city. Renting or buying in a given school zone may be the most straightforward strategy for getting into a popular public school. But neighborhoods with coveted public schools tend to be pricey. The good news is if you can’t afford to stay, your children don’t have to switch schools. They have the right to remain in the same public school until graduation, regardless of where in the city the family lives after registration day, according to the Department of Education. The idea behind this longstanding regulation is to offer stability to children. Some parents in overcrowded schools bristle at families who take advantage of the rule with no intention of staying in the neighborhood. But the Education Department does not track the movement of families after enrollment. And families who end up leaving the zone often would prefer to stay but can’t for financial reasons. When Sundus Kubba moved from Ann Arbor, Mich., to take an investment banking job in New York four years ago, she and her husband, Joe Kazemi, a graduate student and independent statistician, searched for a rental that would put their daughter, Maya, within the zone for the highly sought-after P. S. 87 on the Upper West Side. “We had to be very specific with addresses — what side of a street an apartment was on,” Mr. Kazemi recalled. The couple rented a two-bedroom on the second floor of a walk-up two blocks from P. S. 87. In 2011, Maya began kindergarten at the school, which offers a dual-language program of English and Spanish and runs through fifth grade. This year, with Maya in first grade, the family searched for a place to buy in the neighborhood but found nothing they could afford. So with the help of Stefania Cardinali, a broker at Citi Habitats, they began looking in Harlem and Hamilton Heights. “We can get more for our money uptown,” said Mr. Kazemi, noting that the 15- to 25-minute subway commute wasn’t bad. Last month the couple went into contract on a two-bedroom two-bath apartment with a private rooftop cabana in a full-service building in Hamilton Heights for $680,000. A recent online search for a comparable place in the P. S. 87 zone found listings from $995,000 to $3.85 million. Now the family is zoned for P. S. 153, which has lower test scores than P. S. 87, but also has gifted-and-talented classes and language and art programs. School advisers say more parents are apartment-hunting in neighborhoods that offer promising schools with strong leadership and rising attendance rates, including Greenpoint and Windsor Terrace in Brooklyn, and parts of South Harlem, Inwood and Washington Heights in Manhattan. For instance, respectable options like P. S. 180 in Harlem, which teaches prekindergarten through eighth grade, have remained under the radar mainly because they served a low-income community, said Clara Hemphill, the founder of Insideschools.org, a project of the Center for New York City Affairs at the New School that offers profiles of city schools. Julianna LeMieux, an assistant professor of biology at Mercy College, visited schools in Washington Heights, Harlem and the Upper West Side last June in preparation for a move from Boston; her husband, Mark Emerson, had accepted a new job. “We were willing to do whatever it took to get our sons into a good school,” she said. That included squeezing themselves and their boys, 6 and 2, into a one-bedroom on the Upper West Side if necessary. But after visiting P. S. 180 and being impressed by the small class sizes and the diversity of the student population, she narrowed her search to condos in that school’s zone. There were five listings in the Harlem area within their budget. The couple bought a two-bedroom with one and a half baths and a washer/dryer, listed for $520,000. Their elder son, Isaiah, began kindergarten in September at P. S. 180. Ms. LeMieux says the principal greets students by name each morning at drop-off. Many of those families, she said, end up trying to “squeak into the schools” in better-established neighborhoods nearby. But there is often another contingent — a core group of new families who are “drawn to a school that looks promising,” Ms. Szuflita said. Kelly Bare, an editor at The New Yorker magazine, and her husband, Jonathan Cohen, the music booker for “Late Night With Jimmy Fallon,” traded a studio on the Lower East Side for a two-bedroom rental in Prospect Heights about five years ago. Schools weren’t the first thing on their minds. “We were just trying to wrap our heads around being parents,” said Ms. Bare, who was pregnant with their first child at the time. In search of more space and a family-friendly vibe, she said, they were attracted by the neighborhood’s good transportation, proximity to Prospect Park and cultural institutions like the Brooklyn Museum — not to mention the more affordable rents. But soon, apartment prices began to climb, and they had been hoping to buy. The couple decided to hunt on the edge of the neighborhood, on the border of Crown Heights, where they would be able to afford more space. But the school situation was mixed. While Public Schools 9 and 316 in Prospect Heights were gaining attention, P. S. 22 in Crown Heights was underperforming. Enrollment dropped, test scores remained low, safety concerns were raised and teachers complained of unresponsive and demoralizing leadership. Nevertheless, in 2010 Ms. Bare and Mr. Cohen took the leap and bought a new three-bedroom condo on the Crown Heights border for about $600,000. Timing, it turned out, was on their side. The following year the city announced that it would phase out P. S. 22 and replace it with P. S. 705, also known as the Brooklyn Arts and Science Elementary School, which shares a new building with Exceed Charter School and currently teaches through third grade and offers dual-language immersion starting in prekindergarten, as well as art, music, dance and fencing. “It’s like a little gem,” said Ms. Bare, who enrolled Drew, 5, her older child, in prekindergarten and plans to have her daughter, Lizzie, 2, follow in 2015. 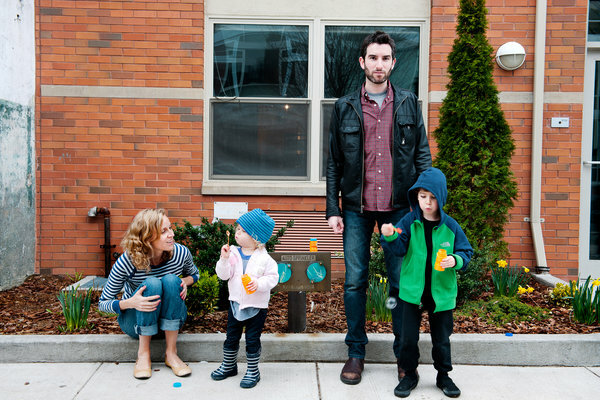 Kelly Bare and her husband, Jonathan Cohen, live on the border of Crown Heights, Brooklyn, with Lizzie, 2, and Drew, 5. They are delighted with Public School 705. The expense and competition involved in sending a child to a good private school in the city is monumental. But with no guarantee that their child will end up in a top-notch public school, some families are viewing private education as a safety net and, gambling that their child gets in, are willing to move to a cheaper place to fund the tuition. In other words: live small, educate big. Marcia Giordano, a New York City real estate broker, and her husband, Shawn, a private chef, were thrilled when P. S. 276, a new elementary school in Battery Park City, opened near their home in 2009, just after the birth of their son, Otto. They had outgrown their one-bedroom. But rather than sell it in a down market, they held onto it and moved to a larger rental unit in the building, so as to remain in the same school zone. Then last year, after Otto, then 3, was put on the waiting list for P. S. 276’s pre-K program, their plan began to feel tenuous. Parents at P. S. 276 were petitioning to limit next year’s kindergarten to avoid overcrowding. So the family moved out of the zone to a cheaper two-bedroom rental in the shadow of the Manhattan Bridge, on what Ms. Giordano calls “the fringe” of Dumbo. They are thus saving about a third of their monthly housing costs and funneling that directly into tuition for a private pre-K program for Otto and child care for their daughter, Chieko, 1. If their plans change again, they can always squeeze back into the apartment they own. “Who knows what will happen with public school?” Ms. Giordano said. “We have to keep the door open for private school. That was the impetus for moving. You know where you would like to live. Now what about the schools? Here are five things to consider when evaluating a school, particularly in changing neighborhoods. Leadership Is Key School advisers agree that a charismatic principal with a clear vision and a deep respect for students is crucial. Enthusiastic teachers and active parents tend to follow. Attendance Rising attendance rates — a sign that more families are being drawn to a school — are often a leading indicator of improvement. Beyond Scores Although the number of students meeting state standards is important, improvements in school quality may not be reflected in test scores until the kindergartners who benefited from new teaching methods, for example, are tested for the first time in the third grade. What’s on the Walls? Proudly displayed student projects that demonstrate individual thought and creativity are what you want to see, rather than cookie-cutter art projects or decorations made by the teacher. You can also tell a lot about writing skills by what students have composed. Are Parents Involved? Invitations for parents to volunteer, attend school events or take ownership of the school in some way can indicate a supportive community. Summer is the perfect time for kids to continue their French studies outside of the classroom setting. For anyone looking for the perfect French summer camp in New York City, here is a comprehensive list of the many options. If anyone has any other summer camps they would like to publicize... please feel free to post others in the comments!